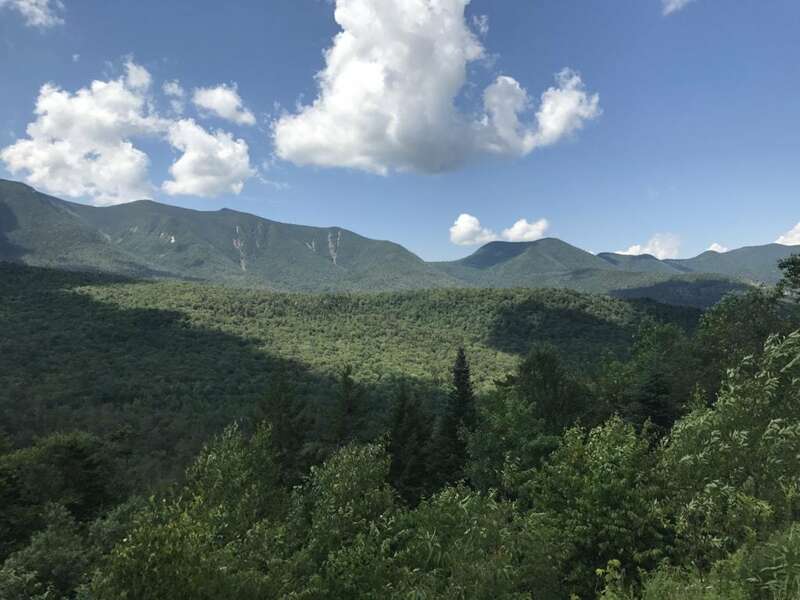 Growing up in Massachusetts, I spent MANY weekends up in New Hampshire hiking and backpacking the White Mountains. In fact, one summer when I was 23, I quit my job and spent the entire summer hiking all the (48) 4000 footers. Next to Disney, the White Mountains are my happy place. Now that my girls are old enough, I knew it was time to take them there. We flew into Manchester and then drove for a little over an hour to get to the town of Lincoln where I rented a condo through VRBO. 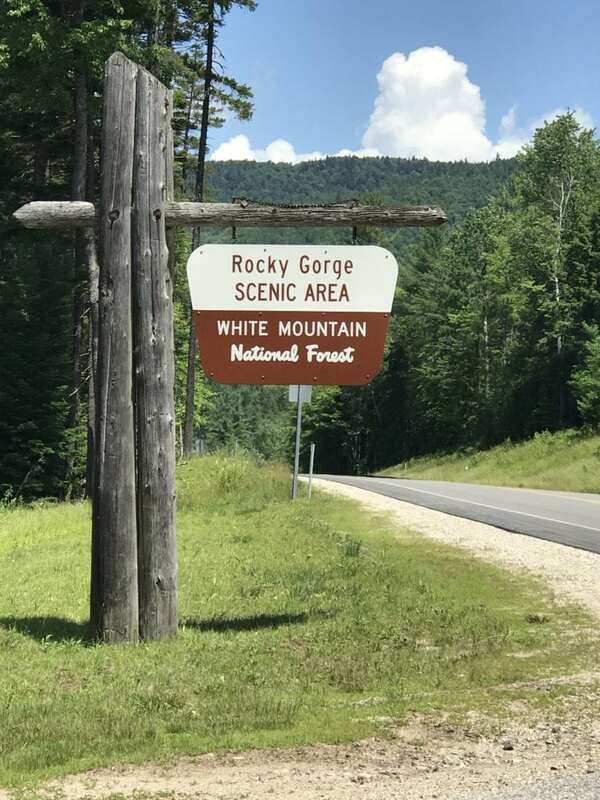 It’s right in Franconia Notch which is one of my favorite spots in the whites. 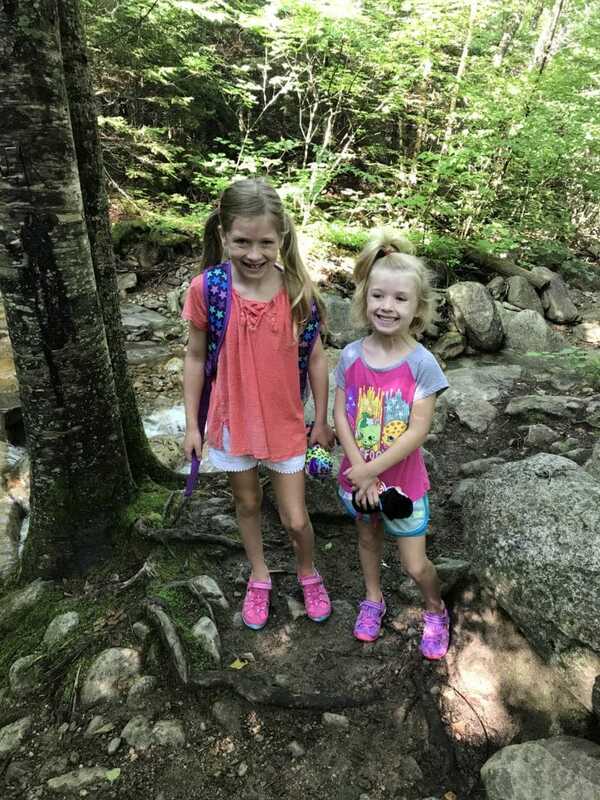 After seeing the mountains, my girls really wanted to hike to the top of one. 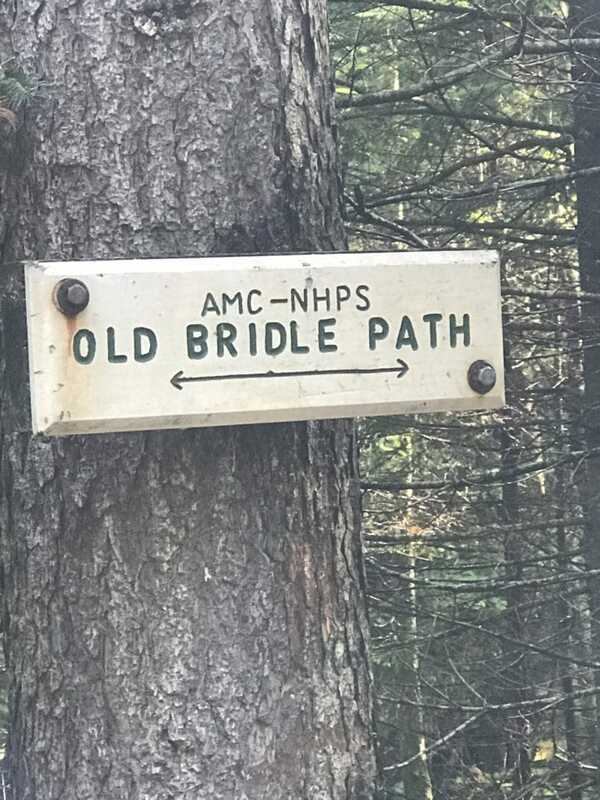 So on our first day there, we headed up Old Bridle Path to hike Lafayette. It’s one of my favorite hikes, so I was excited. It’s a 4 mile hike straight up. My girls had a blast, but we did not make it all the way to the top before my little one wanted to turn back. I was amazed she made it 2 miles! She is only 6. 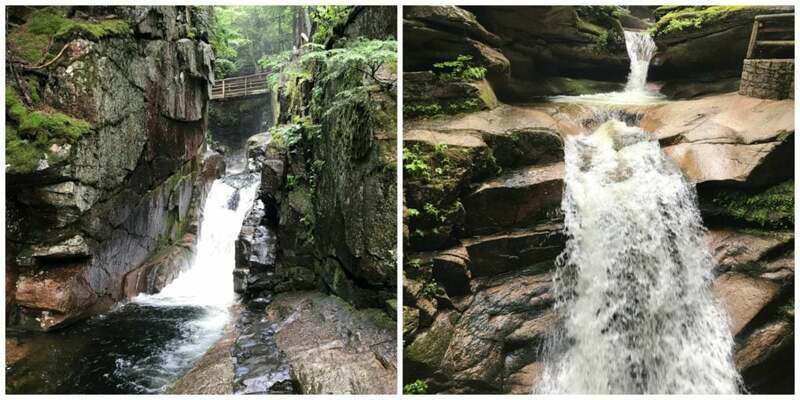 If you ever make it to New Hampshire, definitely give this trail a try. If you can get to the top you get awesome views of the notch on one side, and the Pemi wilderness on the other side. I snapped that pic on the trail about 1 mile up. This was us at the end. They had a blast and the weather was gorgeous. The next day we met up with a friend of mine for a hike in Lincoln Woods. 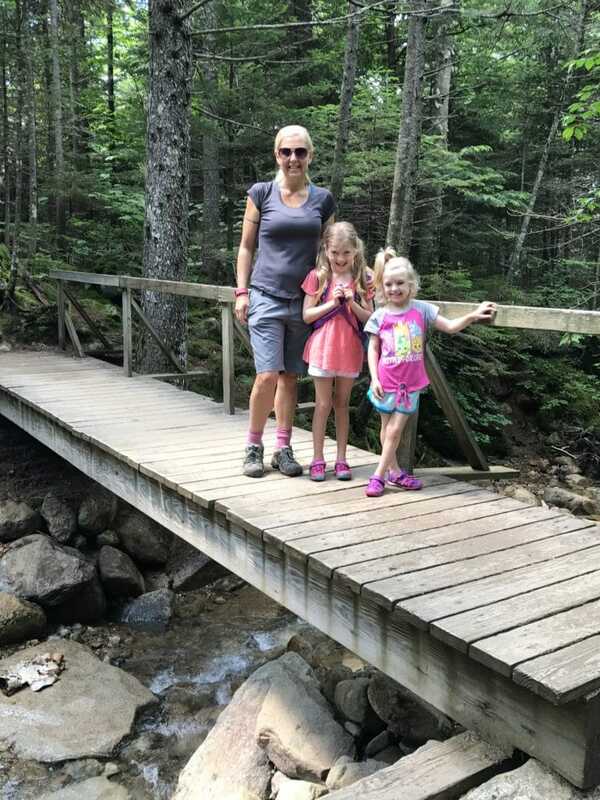 It’s a super easy trail and a great one to do with kids. Right off 112 in Lincoln close to Loon Mountain. 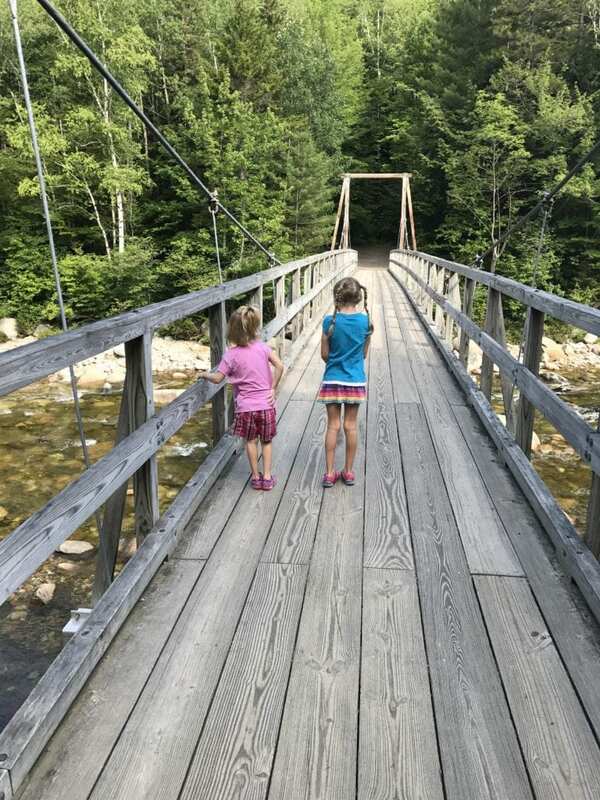 We did the Wilderness Trail which follows the Pemigewasset River (Pemi for short). After that short hike, we headed off to the Kancamagus Highway which is a scenic road through the White Mountains. 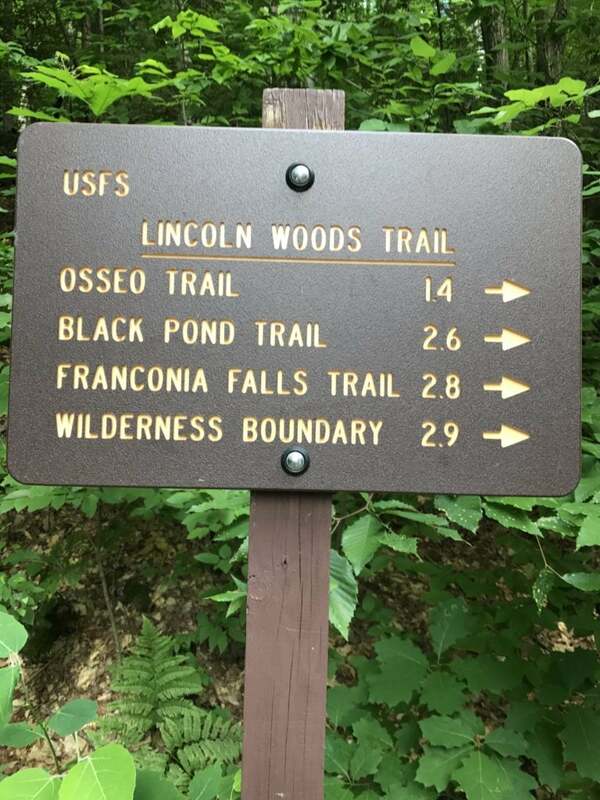 There are MANY areas to stop and hike throughout. 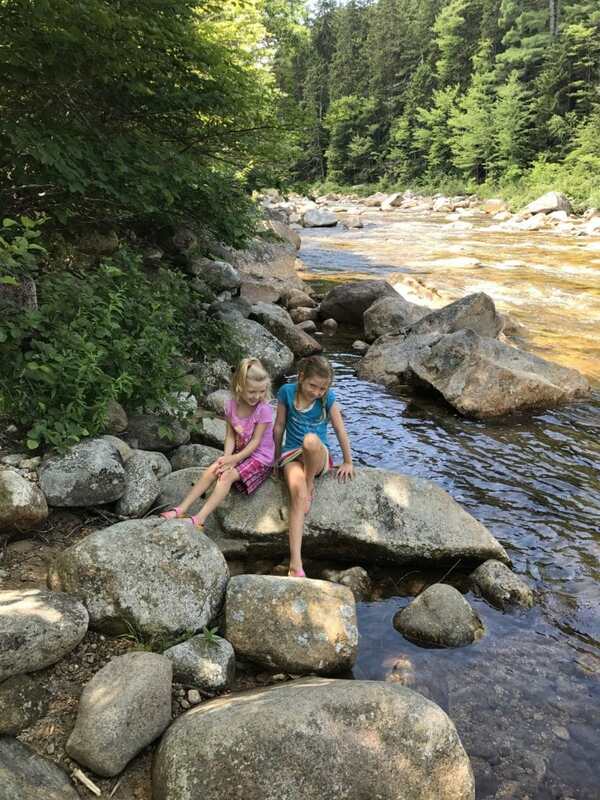 We stopped at Rocky Gorge so the kids could play in the water. There was also a small hike there that led you to a lake area. 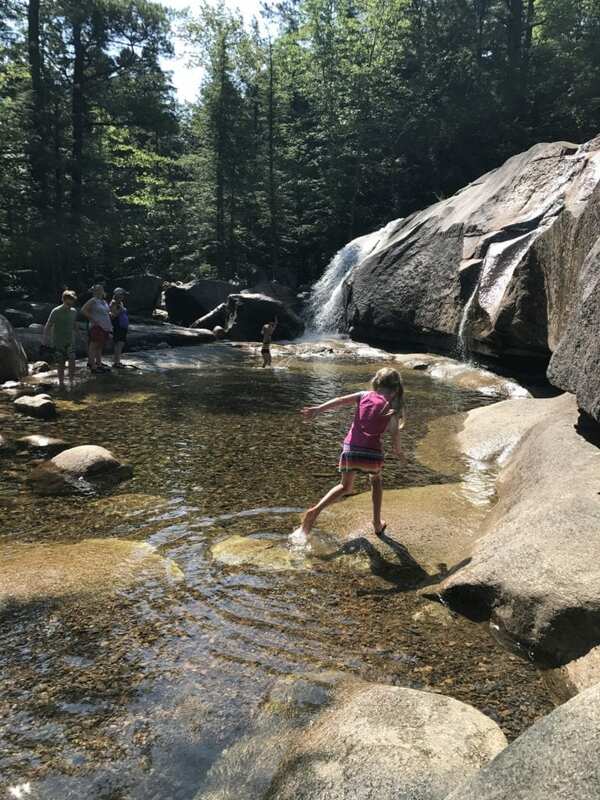 We also hiked to Sabbaday Falls off the Kancamagus Highway. This is just a short hike and totally worth it. Absolutely gorgeous. 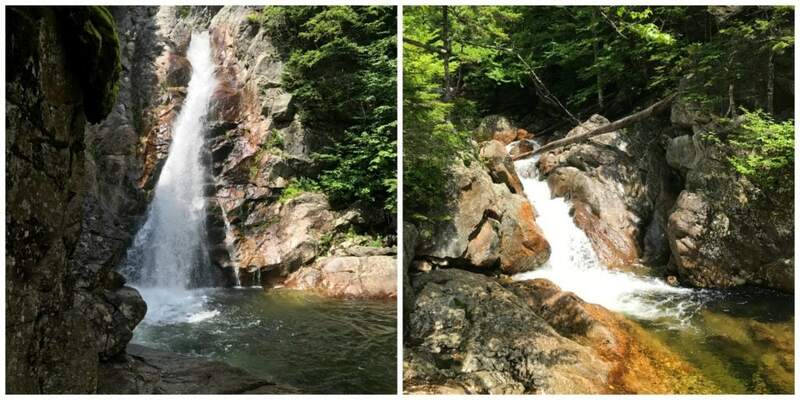 We also drove over to North Conway and checked out Glen Ellis Falls in Jackson, NH. Another short hike to a beautiful waterfall. My girls got a huge kick out of the tunnel under the road! My dad and stepmom came up to visit us while we were there. They live in Massachusetts. So they watched my baby girl Olive while my older daughter and I were able to get a hike in together. 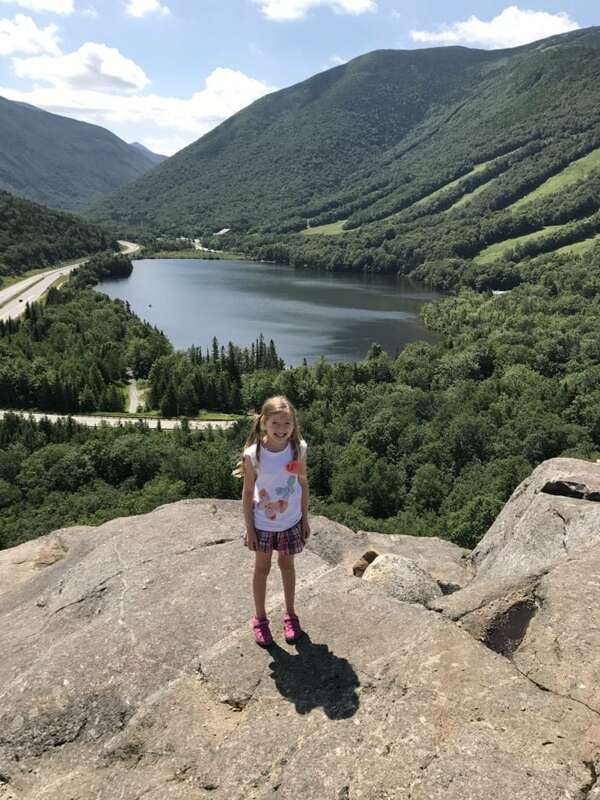 We hiked Artist’s Bluff and Bald Mountain in Franconia Notch. It’s a great hike that’s relatively easier but it still gives you stunning views of the notch. The weather couldn’t have been more perfect. So clear so we had great views. 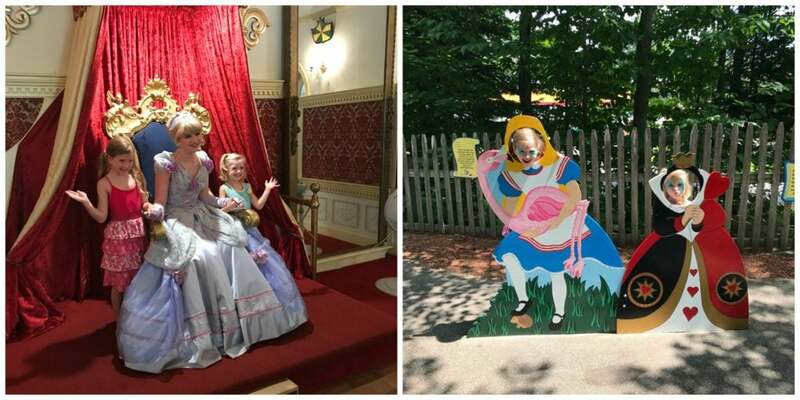 We also spent some time at Storyland in Bartlett NH. It’s a small amusement park geared towards little kids. If you buy your tickets on line and print them, you can save a lot of time waiting in line to get in. On the last day, we went to Diana’s Bath in North Conway. It’s a large waterfall area with many places for the kids to get in a swim a bit. To get there, you have to walk about .06 miles in, but it’s definitely worth it. The kids had a blast. The parking lot fills up really early, so it’s best to get there as soon as you can in the morning.